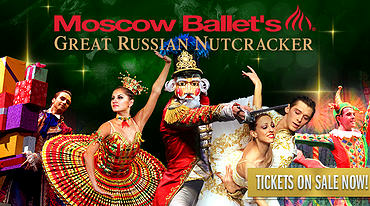 I was given the opportunity to see the Moscow Ballet at the beautiful art deco " Wiltern Theatre ". It didn't disappoint , The music and costumes were both elegant and wonderful to listen too ! The Moscow Ballet was fun ,fun ,fun to watch and I was very entertained by the wonderful dancers and their performances . It's a great show for both adults and children alike ! I loved every minute ! and you will too ! A must see performance by the "Moscow Ballet ". I didn't want to leave my seat or miss a second of the performance. It's the ultimate holiday tradition and creates memories for a lifetime. The production includes over 200 romantic costumes and 10' tall playful animal puppets; shimmering colorful, backdrops splashed with 3-D effects; life-sized Matrushka (Nesting) Dolls and a puppet show for shadowing the Nutcracker Story at the opening Christmas Party. During the battle with Nutcracker Prince and the 3-headed Rat King, a golden cannon shoots roses! In the Magical Snow Forest an authentic Russian style Troika Sleigh, known as the fastest sleigh in the world, is escorted by Father Christmas (Ded Moroz) and Snow Maiden (Snegurochka) on their way to Act II. The Great Russian Nutcracker is known for its dedication to world peace with Act II named the "Land of Peace and Harmony." The first scene of Act II features a stunning "Dove of Peace" with a 20' wingspan and danced by 2 dancers each with one feathered wing. All ages feel the spirit of the season at Moscow Ballet's Great Russian Nutcracker! Use the code JOY to get the biggest discount of the season for your family.